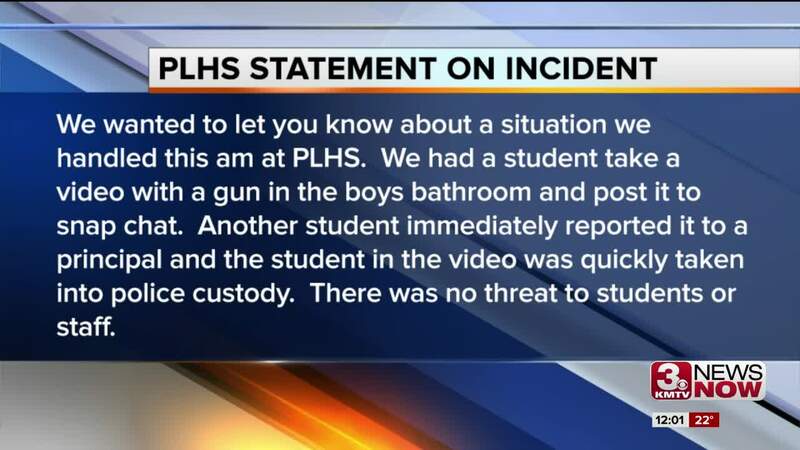 A male student at Papillion-La Vista high school was arrested after another student saw a SnapChat video of a gun in a bathroom of the school this morning, according to school officials. Annette Eyman, communications director for Papillion-La Vista Community Schools, said no threats were made, and that a student was taken into custody quickly. Eyman credited the quick-thinking student and law enforcement for handling the situation. She said the senior was arrested within minutes from when the video was seen. She did not know the type of gun or whether it was loaded. We wanted to let you know about a situation we handled this am at PLHS. We had a student take a video with a gun in the boys bathroom and post it to snap chat. Another student immediately reported it to a principal and the student in the video was quickly taken into police custody. There was no threat to students or staff. The student will now be facing consequences with both the school and law enforcement. We want to thank the student that immediately reported the incident and the quick response of law enforcement. Safety of our student and staff continues to be a top priority at PLHS. The school's resource officer, Andy Mahan, gave a shout-out on Twitter to the student who alerted officials.